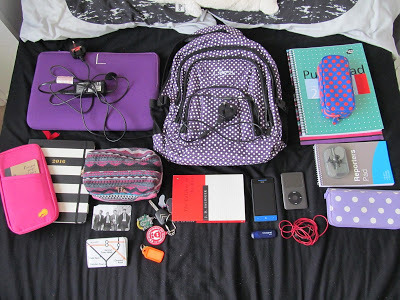 Tomorrow is my first day at a brand new college; I’m very excited now I’m all organised for it (I think). Tonight will be spent pampering myself, watching rugby and getting an early night. But before all of that, I’ve decided to bring you all along on my journey and show you what I’ll be putting inside my snazzy new rucksack! I’ll also be taking two water bottles every day and my packed lunch but here is everything else that will be carried on my back! Extra large rucksack- It was so difficult to find a big rucksack that was large enough to fit in my laptop. I needed that but also wanted it to look stylish when I came across this purple spotty rucksack on Amazon. It has four pockets decreasing in size, two side drinks holders and a small internal pocket at the back too. Laptop and charger- I’m unsure whether I’ll need this on a daily basis but at least I know that it fits in! A4 notebook and pencil case- I’m old-fashioned and like writing notes but I colour-coordinate my notes so just a simple black biro is not suffice! Reporter pad- This is the perfect size for practising shorthand so I’ve been told! Mini stationary set- My dad found this super cute mini stapler, hole punch and sellotape for me about a year ago. Kate Spade planner and sticker pouch- My gorgeous new planner includes everything I do on a daily basis and I like to have it to hand to add in assignments, appointments and events. The sticker pouch means I can add in stickers when I’m out and about too! Tram pass/train season ticket- If I don’t have this, I can’t make it to Sheffield! Keys- I have to drive to the station to then get on the train so these are an essential also. Toiletry bag- I’m not your typical girl; my toiletry bag includes ibuprofen, a mirror, Vaseline, anti-bacterial handwash and hair grips! A good book- I’ll be spending over 3 hours a day on the train so a good book is necessary. Some days I’ll take my Kobo but at the moment I’m reading Catcher in the Rye so that will be joining me tomorrow. USB stick- Even if I don’t take my laptop, I know I’ll be using computers at college so I’ll need to back up my files especially if I need to continue the work at home. Phone- Do I really need to explain why I’m taking my phone?! iPod and headphones- I can’t bear train journeys with no music so this is another essential for me! I’ve created some playlists for me to listen to as well as just regular albums and Scott Mills podcasts. Purse- I don’t plan on spending much money when I’m there but I always keep my driving licence on me and will be getting a card from my college as well. Have I forgotten anything for tomorrow before it’s too late? Leave me a comment below!